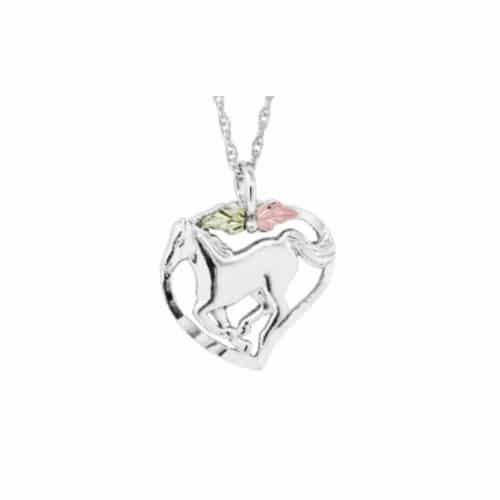 That horse lover on your list is certain to be dazzled by this sparkling Black Hills Gold Silver Horse Necklace! 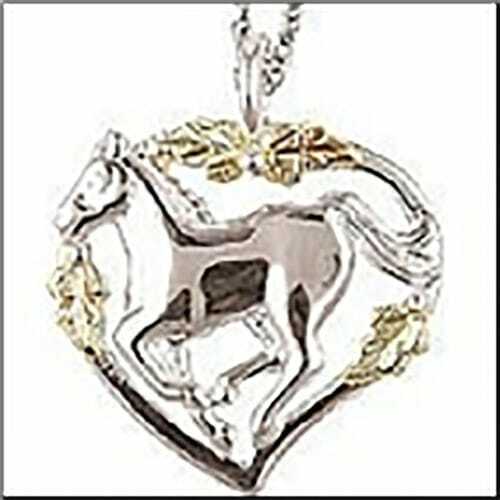 Featuring authentic, brilliant Black Hills Gold accents, this dazzling horse necklace is certain to be a cherished keepsake for that horse lover on your list for many years to come. With 12 Karat red gold and 12 Karat green gold leaves that surround an immaculate sterling silver horse, all arranged exquisitely on a diamond cut edge sterling silver heart, this glamorous Black Hills Gold necklace is a fantastic addition to your favorite horse lovers’ beloved collection, and is an excellent unique Christmas gift that can be worn daily as well. The elegant pendant comes complete with an 18 inch sterling silver rope chain that features a convenient spring ring clasp, making it both simple and comfortable to wear. Since Black Hills Gold is well known for becoming more vibrant the longer it is worn, this durable but dazzling Black Hills Gold necklace will withhold its beauty for decades to come. Order yours today and enjoy FREE shipping!